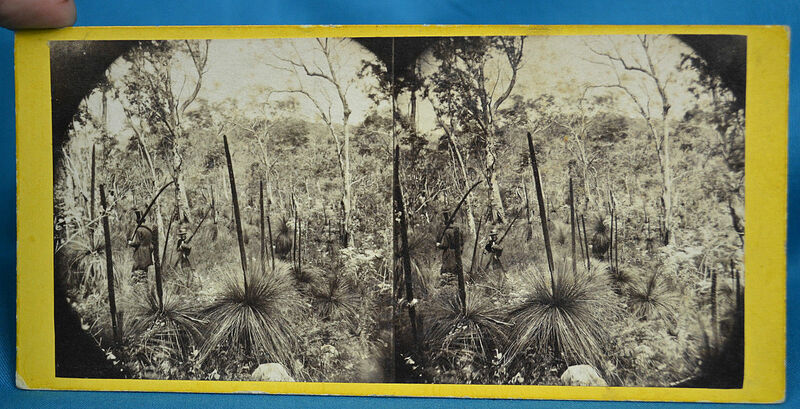 Here is a stereograph attributed to Tasmanian photographer Samuel Clifford ca. 1868 which was cleanly mounted in a binocular frame. The examples below, in relation to Stephen Budden’s visit to Tasmania in 1873, were not so fortunate to survive in such original condition. 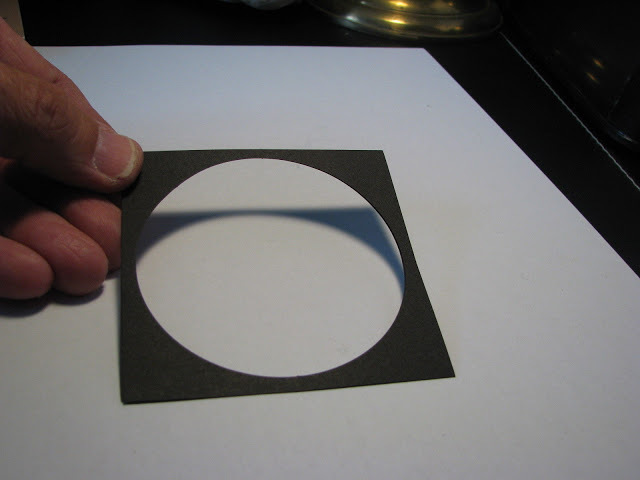 They were printed first as slides from the glass plate negative, using black circular or rectangular masks, and were subsequently printed from the slide onto a stereographic mount, leaving the blackened edges of the mask visible. 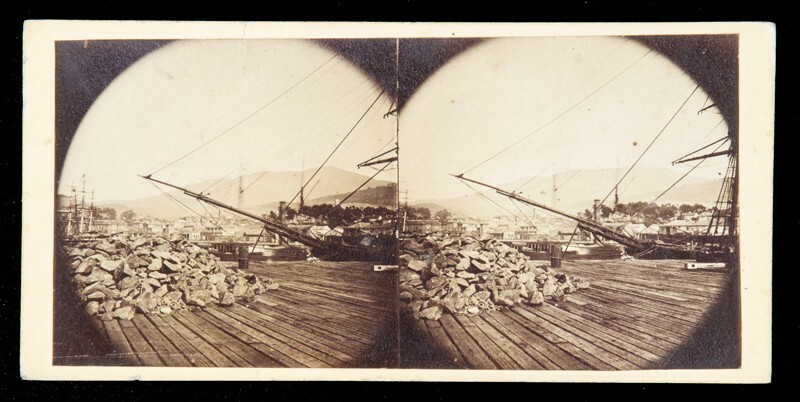 Physical description: 1 stereoscopic pair of photographs : sepia toned ; each 7 cm. in diam. 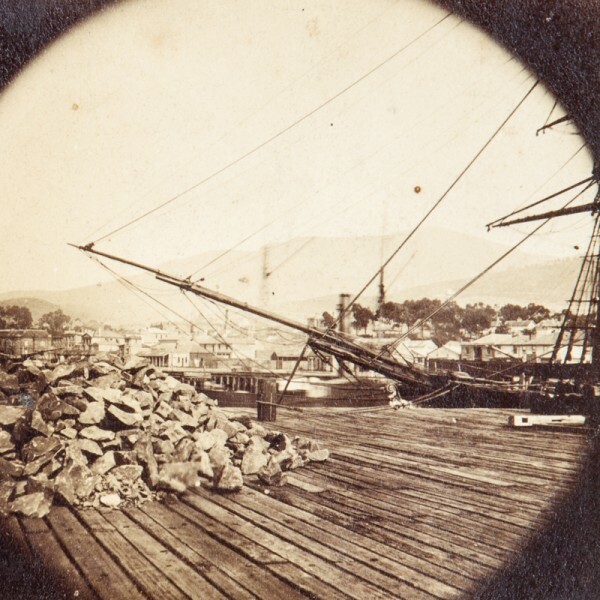 Stephen Budden, commercial agent from Lyttleton, New Zealand for the Canterbury Acclimatisation Society arrived at New Wharf, Hobart, Tasmania, on 4th August 1873, the sole passenger aboard the brig Chanticleer under command of Capt. G. A. Phillips. His mission was to superintend a shipment of salmon and salmon trout ova back to New Zealand. 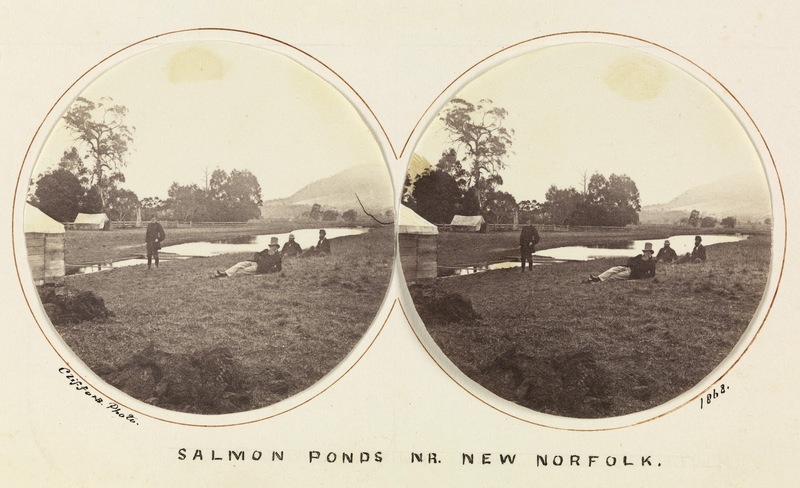 With assistance from the Tasmanian Acclimatisation Society and naturalist and amateur photographer, Morton Allport, who was instrumental in the introduction of salmon ova and European fish to Tasmania in the 1860s, two shipments were sent: the first of salmon trout ova was accompanied by Stephen Budden on the Clematis, departing 29th August; and the second of 500 brown trout ova destined for the Auckland Climatisation Society left on the Bella Mary on the 23rd August 1873. As a result of Stephen Budden’s successful mission, Morton Allport was made an honorary life member of the Otago Acclimatisation Society. 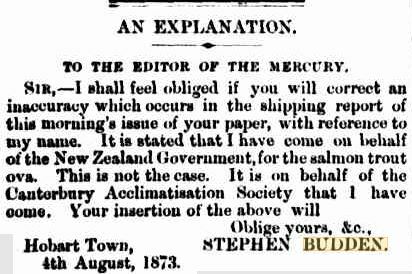 The first Mercury report of Stephen Budden’s arrival in Hobart assumed he was an official of the New Zealand Government. On reading it, he penned a letter to the editor, requesting correction. The brig Chanticleer, Captain G. A. Phillips, from Lyttleton, New Zealand, in ballast, came into port on Saturday afternoon…. She has one passenger, a Mr Budden, who has come up on the part of the New Zealand Government to superintend the shipment of trout and salmon trout ova to New Zealand. [Title from contemporary inscription verso]. 1861-1865. 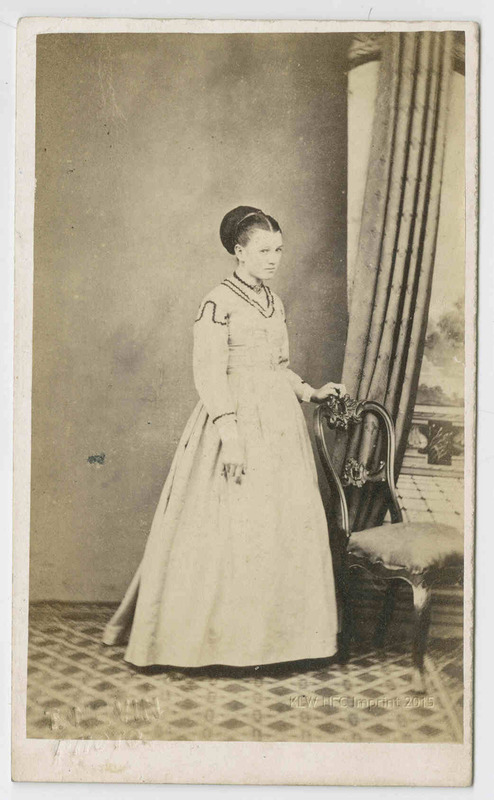 Stereoscopic albumen print photograph, each image approximately 80 x 80 mm, on pale yellow card mount; a 15 mm tear at upper edge, otherwise the albumen prints are in good condition. Quite a few of these rather unappealing amateur reprints have appeared in the market place in recent times. 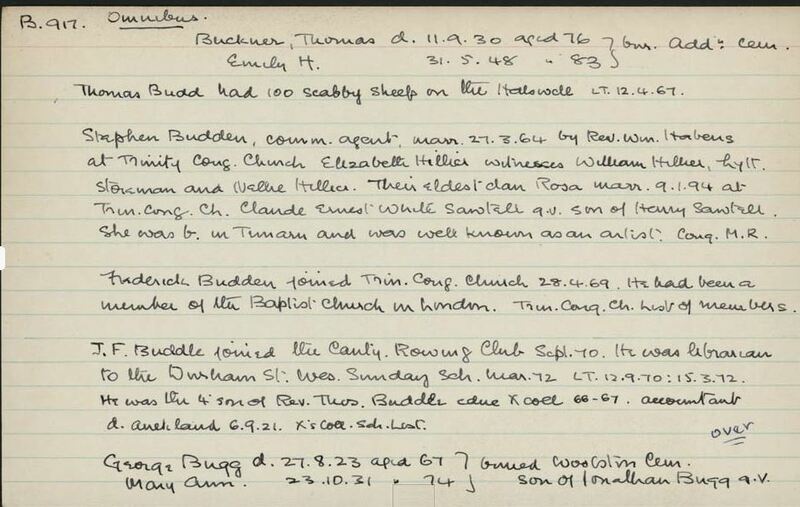 Most were transcribed in a contemporary hand with general information about the place of capture, eg. a building or scenic view, but with the word “Tasmania” included, simply because the collector was an intercolonial visitor who needed a reminder of the photograph’s subject. Some have a note written verso stating what the building or streetscape looked like “30 years ago“, eg. St. David’s Church in Macquarie Street, dating the print from its original photograph ca. 1870 to ca. 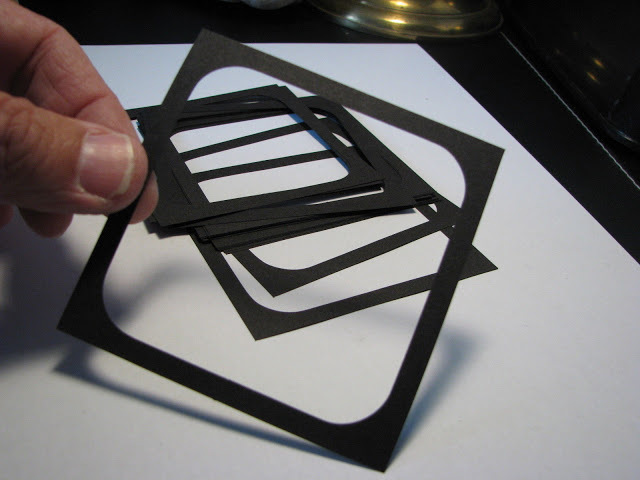 1890. Who was responsible for reprinting these stereographs from the slides with black masks onto a yellow square card, or why they were reprinted in this manner, is not known, but Stephen Budden’s brother Frank Budden, was resident of London in the 1880s, and his son’s name – T. F. Budden – stamped on the versos of some of these reprints, suggests that the Budden family may be the source of the reprints. Dr Tice Frank Budden became a renowned photographer of trains in Britain in the 1890s. 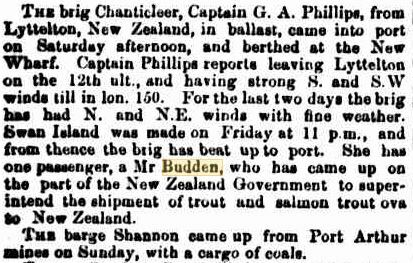 Two shipments were sent: one of salmon trout ova was accompanied by Stephen Budden on the Clematis, departing 29th August; and the second of 500 brown trout ova destined for the Auckland Climatisation Society left on the Bella Mary the 23rd August 1873. The brig Clematis, Capt. Johnson, entered and cleared out yesterday for Lyttleton with a full cargo of timber, hops, and bark. She also takes down some Salmon Trout Ova under the charge of S. Budden Esq., for the Canterbury Acclimatisation Society. The Clematis will sail early this morning. 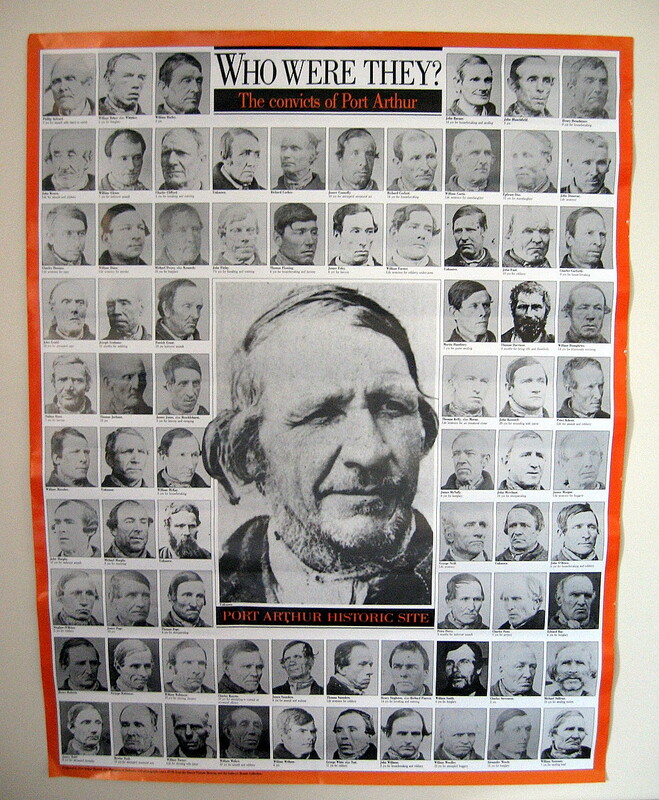 Stephen Budden spent 25 days in Tasmania. He travelled around and across the island with a group attached to public institutions, whom he thanked in this article. published in the Mercury, 6th September 1873. 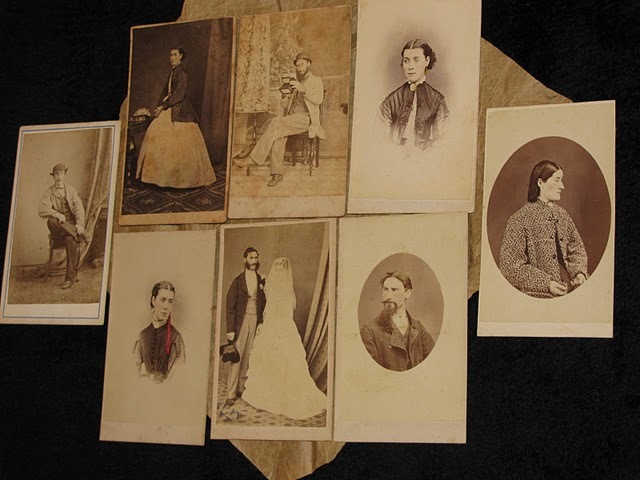 His collection of photographs, probably sourced from Morton Allport, included scenes taken at Port Arthur, at Grass Tree Hill, Richmond, at Cascades, South Hobart, at Cora Linn in Launceston, on the summit of Mount Wellington, and at Government House, Hobart. By the barque Bella Mary, for Auckland, on the 23rd ult., a further shipment of brown trout ova was made by the Salmon Commissioners to the Acclimatisation Society of Auckland, Now Zealand. The ova was packed, under the superintendence of Mr. Buckland, in ice and snow, and it is to be hoped that it will arrive all safe. The shipment now made is 500 brown trout ova. 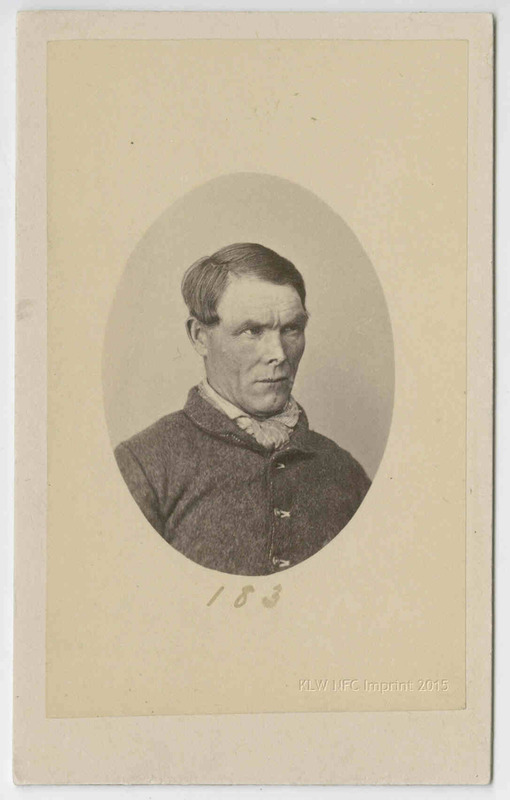 On the 19th October, 1870, a resident of Oatlands received from Mr. Morton Allport of Hobart Town, a small bottle of perch ova, with which he, Mr. R. Robinson, at once rowed out into the Lake and deposited in about eighteen inches of water in a sedgy secluded spot. The lake is about 800 acres in extent, or considerably larger than the Government Domain at Hobart Town, and a remarkably fine sheet of water of the average depth of about 10 foot, and swarms with fish food. Nothing was heard of the little jumping things in the eggs, in the bottle, till last January, when a small shoal of fish were seen floating to and fro in the waters on the shores of the lake, and one being caught was forwarded to Mr. Allport in an envelope, for his decision as to its genus, and pronounced a perch by that gentleman. The recent heavy rains, and those of last year, raised the waters of the lake till they flowed out of the outlet at the northern extremity, forming a tributary to the Jordan, and, as a result, a dozen or more perch of various sizes have been washed through the outlet, thus proving satisfactorily that one of Tasmania’s lakes, with the thoroughly English name of ” Dulverton ” has been well stocked with that fine fish. 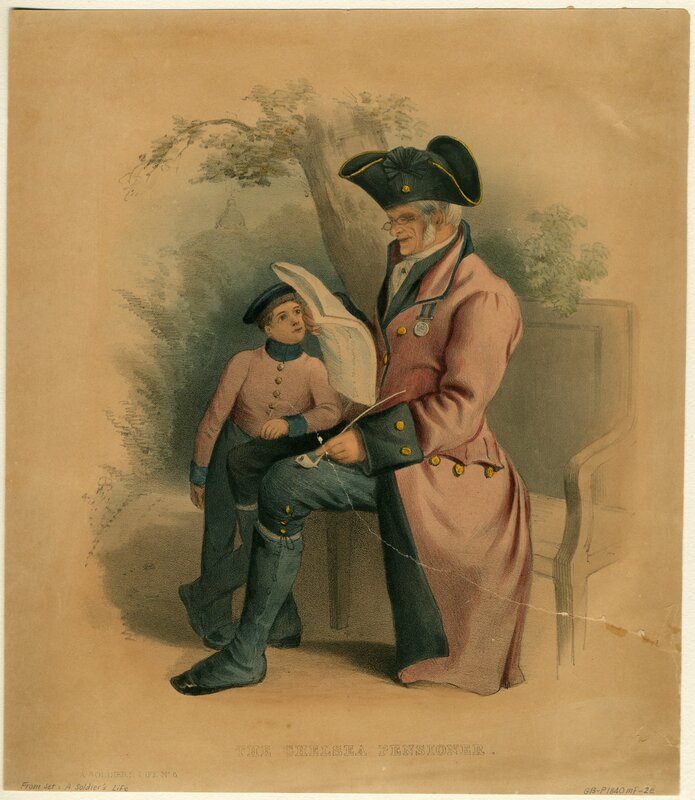 One may fairly predicate, that not the least attractive portion, in days to come, of the enticements, held out by Tasmania to visitors, will be a day’s perch fishing, with no licence to pay, in this water, with a summer temperature perhaps the breeziest and most pleasant in Australia, and not bad shooting thrown in. Many persons have during the past few days had an opportunity of witnessing what, in this colony, is the interesting process of trout-hatching, at the Museum. A hundred ova of the brown trout or salmo fario were obtained from the River Plenty, and placed in a box, containing a large number of pebbles at the bottom, and fresh water. The water is continually being changed, and is kept at a great temperature, The ova were put in on the 11th August, and the first fish was hatched on the 27th of that month. There are now a number of them hatched, and very curious little things they look. The fish are kept in the box till they are about an inch and a half in length, and then they are placed in a fresh water stream to provide their own living. In the box they are fed with insects, and, judging by the ravenous manner in which they seize them, they show their partiality for that description of food. 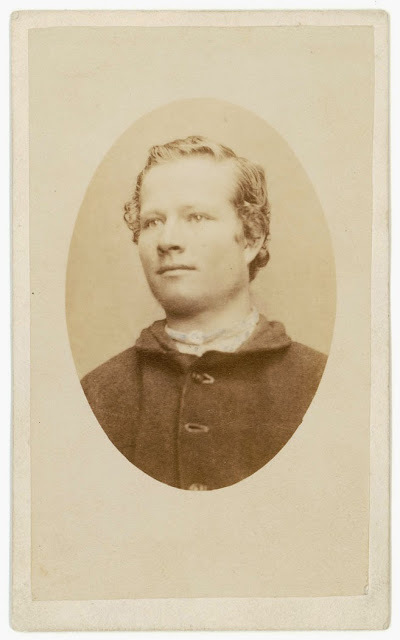 Samuel Clifford and Thomas Nevin were close friends and colleagues who travelled around Tasmania on photographic excursions in the 1870s and supported each other’s business and family interests. 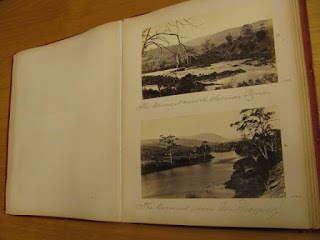 Above: Photographs of the River Derwent near the Salmon Ponds taken and printed conjointly by Thomas J. Nevin and Samuel Clifford, published in an album titled “Tasmanian Views” 1873. Photos copyright © KLW NFC Imprint 2012. State Library of Tasmania Collections. These are some of the reprints of stereographs which have surfaced in the market place (fine arts dealers, eBay etc), taken in Tasmania. They were mounted originally on binocular cardboard mounts, then reprinted on yellow square mounts, transcribed on versos with the words “Hobart Town” or “Tasmania” in every instance. The handwriting is uniformly similar on all the versos of these examples. 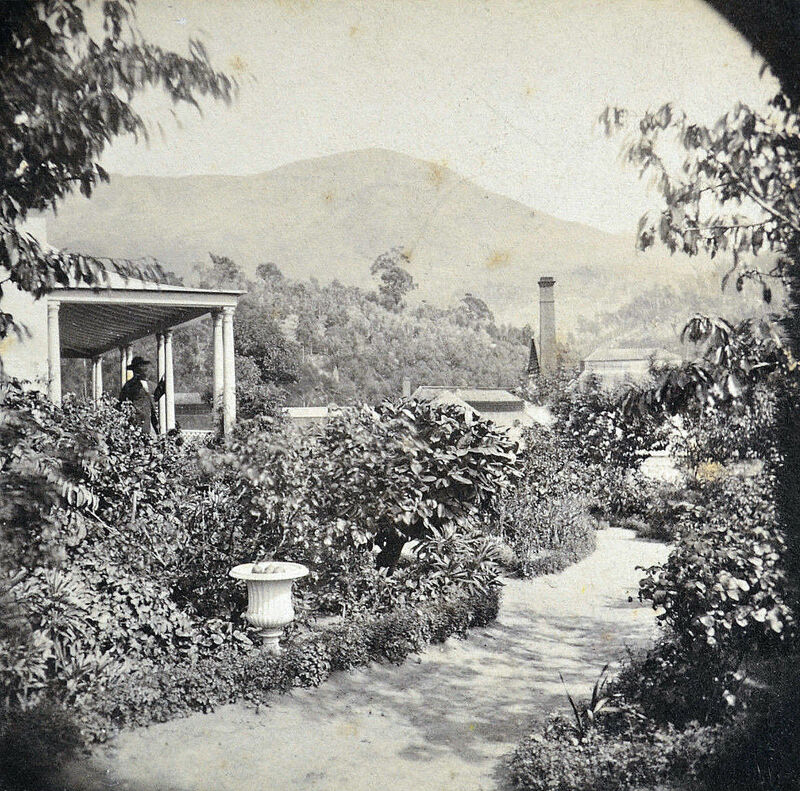 Mount Wellington from Mr James Milne Wilson’s verandah 1873. 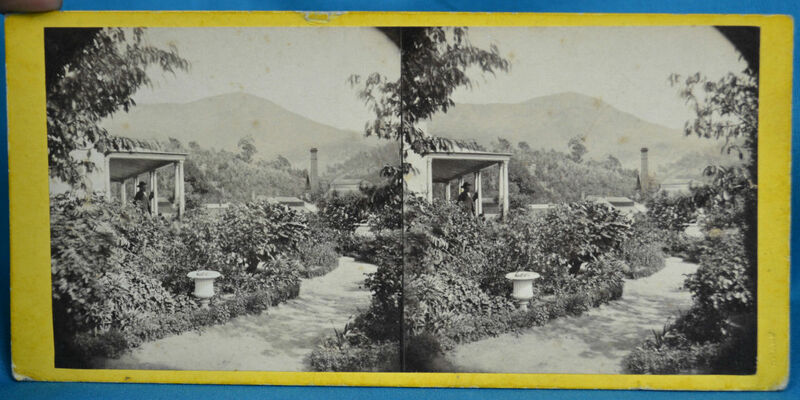 Detail: Mr. J. M. Wilson on his verandah, Cascades.. 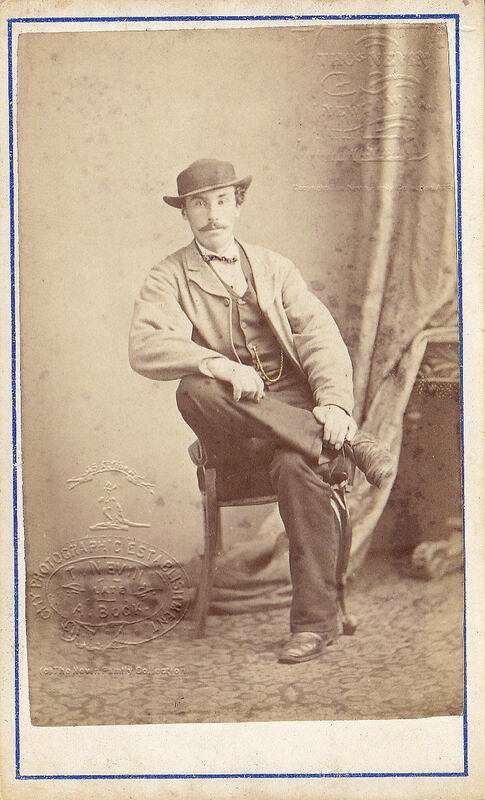 The connection to railways, between this photograph of James Milne Wilson (1812–1880) and its passing down to Stephen Budden’s nephew, T. F. Budden whose passion was photographing trains, is Wilson’s successful legislation of the Hobart-Launceston main line Railway Act and the 1871 contract for its construction with a 3 ft 6 ins (107 cm) gauge. Read more about (Sir) James Milne Wilson here at Australian Dictionary of Biography. Brief biographical notes, example, and references. Dr Tice F Budden was educated in Bath and at Cambridge University, where he took up photography in 1889. He is considered to be one of the pioneers of railway photography alongside P W Pilcher, E J Bedford, and R H Bleasdale who are also represented in the NRM collections. He initially concentrated on stationary locomotives but soon experimented, taking some of the first photographs of engines in motion. His career as a railway photographer lasted over fifty years – he captured the final years of the GWR broad gauge lines at Ealing in 1892 and took his last pictures near his home in Dorking just after the Second World War. On her arrival back at Lynn, Gazelle was again photographed, this time in the yard of the GER locomotive shed. 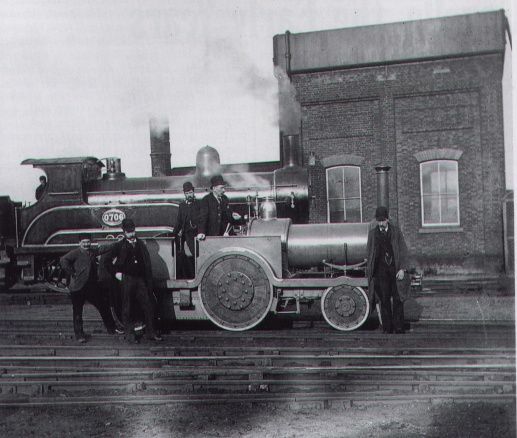 The cameraman was Dr Tice F. Budden, who had taken up railway photography as an undergraduate at Cambridge in 1889, and had evidently been tipped off that there would be a chance to record an unusual event. 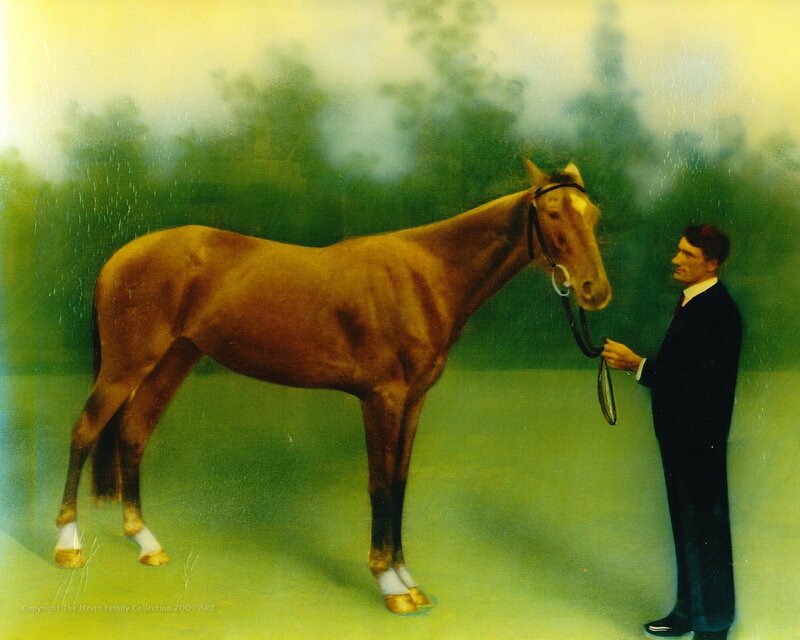 In one of the photographs “Gazelle” is posed alongside No. 0706 of the Great Eastern, a rebuild of a Sinclair compound 4-4-0 and a regular performer on the Cambridge main line at that period.